We’re working on a big digital project at Wellcome Collection this year (and you’re going to hear lots more about it in October, I promise). We’ve been working in partnership with Brighton agency Clearleft on a process which began with some pretty vaguely-defined objectives for a digital product, and is now in code production. The project itself and what we’re designing is pretty exciting. But so has the process. There’s been a lot of brainstorming and ideation, with workshops and idea generation sessions forming part of a process in which we come up with lots of ideas, winnow down to the ones that we think will work and are testable, and then develop them. A lot of these exercises have been quite playful. Not strictly as games, but elements of exchange, competition, scoring and teams have been present throughout. And why should we have all the fun? We wanted to spread the joy, and communicate some of the more playful aspects of what’s sometimes been a difficult project to our colleagues. 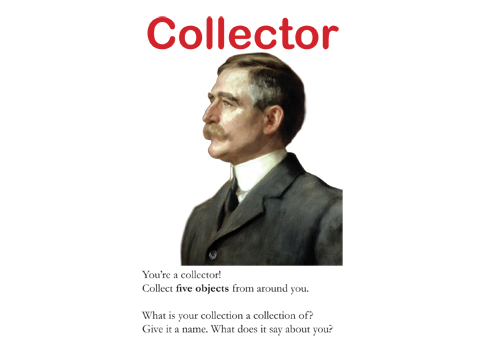 So for one of our monthly divisional meetings here at the Trust, we devised a game to help us think about one of the subjects we’re tackling in the project: collecting, the history of collecting, and the reasons why people collect things. There are two packs of cards, ‘object cards’ and ‘collector’ cards; both are blank on the reverse. Once collections are complete, the collectors must explain why they have collected what they have collected and what the collection says about them. And here are the two packs of cards we used: the objects (PDF, 6.5MB) and the collectors (PDF, 500KB). The objects are a pretty idiosyncratic bunch: any set from your own collection would work as well. Funnily enough, when we told Alex what we’d done, he told us that his original conception for curate-a-fact had included collectors as well as objects, but that he found in larger groups the collectors dominated. With a roomful of about 30 people, we assembled five good collections (including one rogue one without a collector), and found some very enthusiastic collectors. Vanity, recategorisation and repurposing of objects all played a role in their collections’ stories, as they have historically with all collectors. My main learning from this is that if it was my dayjob to make & adapt games for my colleagues to play, I’d be a very happy man. More seriously, I think that we need more appreciation of the role that playfulness and games play inside organisations both in developing projects and in communicating them. I’d be very interested to hear from anyone else in cultural heritage organisations who have used games and play internally in this way. ← What is a ‘science’ exhibition?